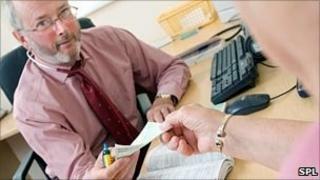 Many doctors recommend treatments to their patients that they would not use themselves, a US study suggests. Experts asked nearly 1,000 US physicians to consider a medical scenario and pick a treatment. But when doctors were asked to imagine themselves as the patient their answers differed significantly. Doctors were far more likely to opt for a therapy carrying a higher chance of death but better odds of side-effect free survival, for example. But for their patients, doctors tended to pick a treatment that erred on the side of survival, regardless of the quality of life, Archives of Internal Medicine reports. Faced with a choice of one of two operations to treat bowel cancer, for example, two-fifths of 242 physicians chose the surgical procedure with a higher rate of death, but a lower rate of adverse effects. Conversely, when asked to make a recommendation for a patient, only a quarter of physicians chose this option. In another scenario, doctors were asked to imagine that either themselves or a patient was infected with a new case of bird flu. They were told a drug treatment was available, and that without this treatment a person who contracted flu would have a 10% risk of death and 30% risk of needing hospital care. Treatment would halve the rate of adverse events but also caused death in 1% of patients and permanent neurological paralysis in 4%. Of nearly 700 doctors, about two-thirds chose to forgo the treatment when imagining they had been infected, to avoid its adverse effects. However, when imagining that a patient had been infected, only half recommended not taking the treatment. Dr Peter Ubel, from Duke University, North Carolina, and colleagues say: "When physicians make treatment recommendations, they think differently than when making decisions for themselves." What is not clear is which is the best way to reach a treatment decision - putting yourself in the shoes of another or not. Indeed, today doctors are often discouraged from giving their own personal opinion and instead are encouraged to present the relevant evidence and information so that the patient can make the choice for themselves. "Our study does not suggest that physicians always make better decisions for others than they would make for themselves. "At most, our study suggests that in some circumstances, the act of making a recommendation might improve decision making," say the researchers. Katherine Murphy, chief executive of UK-based The Patients Association, said it was "very telling" that the research had found many doctors may take a different course of action from the one they would advise their patients to follow. "Doctors are of course human and will weigh up the options subjectively for themselves, no matter what they recommend to their patients. "The difference is that doctors will have all the medical knowledge to back up their decision whereas patients are sometimes entirely reliant on their doctor for information. "If the government is serious about making patient choice a reality, it must ensure that all patients have access to meaningful information in a variety of formats on all treatment options so they can come to a decision which is right for them." Video Should doctors pull their punches over a patient's weight?